Laghu Samrat Yantra with the Clock Tover of City Palace in Background. 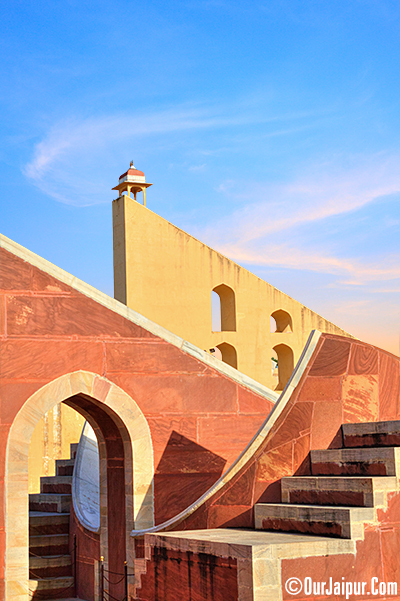 Jantar Mantar is a collection of architectural astronomical instruments, built by Sawai Jai Singh in the early 18th century. 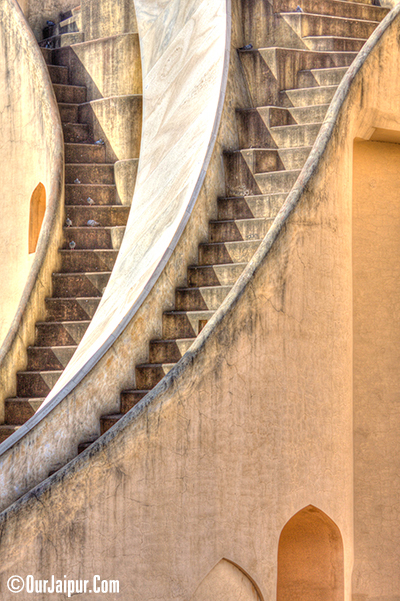 There are many Observatories built all around the world but Jantar Mantar of Jaipur is considered to be one of the biggest in all of them. 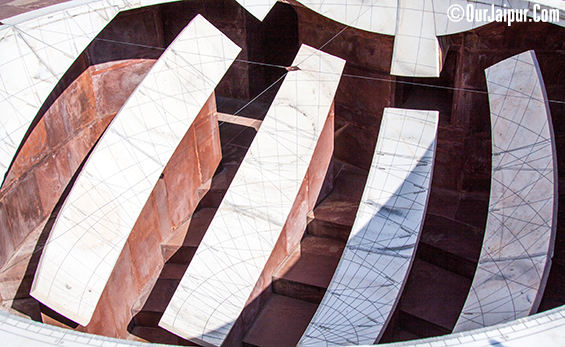 Jantar Mantar is combination of Religion, Science and Art. The name Jantar Mantar is derived from Sanskrit Term Yantra (Instruments) and Mantras ( Formula in this Context Calculation) Yantra was further changed by Jantar translates as Magical. So Jantar Mantar translated in English as Magical Calculations. 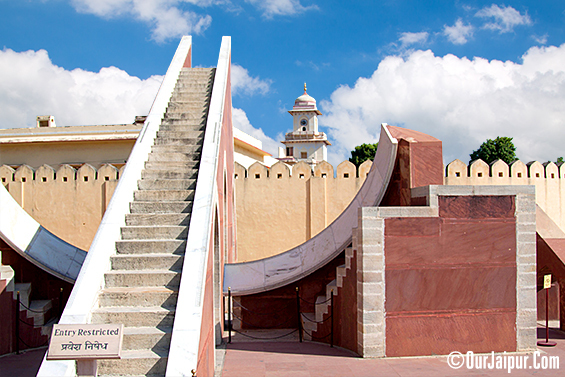 Jantar Mantar of Jaipur was Part of five Observatories built in New Delhi, Ujjain, Varanasi, Matura and Jaipur. The Jantar Mantar of jaipur is biggest in all of them and is in very good Condition; With Thousands of Tourists it also attracts Astronomers, Astrologers and Scientists every year from all around the world. The Observatory Consists of many Giant geometric devices for measuring time, predicting eclipses, tracking stars and so on. . . At old time local astronomers use it to predict the weather for farmers, announcing eclipses and the arrival of monsoons. The Instruments here can tell the time with the accuracy of 2 seconds. 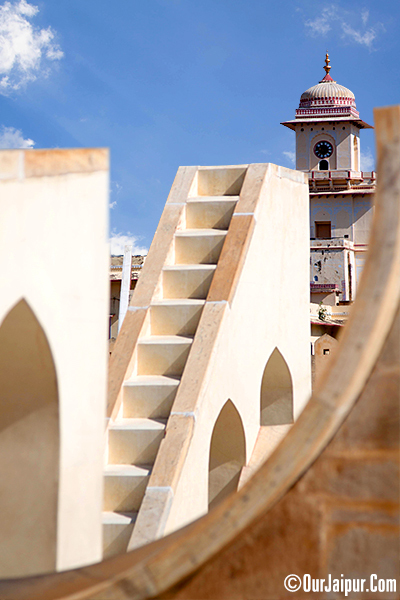 Jantar Mantar, of Jaipur celebrated astronomical observatory is also have a Status of World Heritage Site presented by UNESCO. 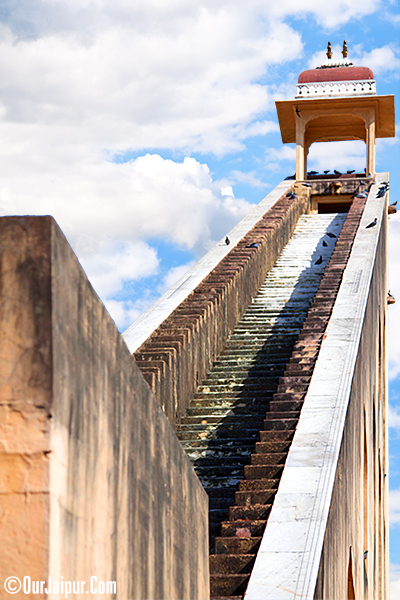 Jantar Mantar is Situated in Jaipur City only Just near the City Palace So you can cover both the Places at the same Visit. On the Whole it’s a Must See Place when you Visit Jaipur. Samrat Yantra (Giant sundial) with other Instruments. Jai Prakash Yantra at Jantar Mantar, Jaipur. I forgot which one was this but I liked the Lines. I love the Sizes of these Instruments You really enjoy Clicking Them. Is so impressive, the structure is amazing! :) Have a good day and thanks for stopping by! I love all your photos, Jaipur is a wonderful place .... I want to visit it soon! Was in jaipur till last evening and enjoyed visiting all these sights!! Thank you for your G+ for my post! Jantar Mantar I visited long back, still the one thing I have a clear picture in my mind of us that sundial!! Very interesting and lovely write up, I was thinking the Delhi is the biggest but never knew the one in Jaipur is the biggest. Very nice clicks. Really amazing, never visited, will surely plan to visit these places. Amazing it such a gorgeous place with with extraordinary architect. The place and the history behind it are most fascinating! Amazing architecture and there's plenty of history. I just love to tour such places. Handsome architecture and I like how you've photographed it. Amazing indeed. No CAD, no Computers, no Programmers yet they built such fantastic structures. Good post. great post honey, i really love the place! Beautiful and very artistic photos!! I don't imagine this places are real. Jai ho Jaipur ki and ofcourse Jantar mantar ki. Great shots, I love this place. pretty place n clicks..nice post..
That place looks like an interesting dream. Beautiful. I have a post of it on my blog too. Lovely pictures , had been to this place long back probably would be visiting in November. Cool post!! I love the pics! Nice informative post with some lovely pictures. Its a wonder we had made so much progress in a variety of fields so early but at present are lagging behind compared to other nations. Soo interesting! Love the last picture!! Your Jaipur is so beautiful. I would love to come an visit all these beautiful sides I see through your photos. But then, maybe that is your skill, to make them all look so beautiful. Fantastic. There is so much character to these photos. What amazing places you show us! Why is the entry restricted in the first pic? All the pics are great. Indian Coffee House, Jaipur. . .
Kuchipudi & Light Classical Music.